What is web services testing? 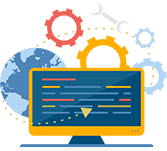 Web services are known as web applications that interact with other web applications to exchange data. Web services include XML, SOAP, HTTP, etc. as they are used to convert the existing applications into web applications. This tutorial is designed to learn the basic concepts of web services are their usage. This tutorial is useful for the readers who wish to learn the basics of web services and their implementation process. This tutorial is basic level tutorial designed to introduce the concepts of web services. There is no prior knowledge of any technology is required to learn this tutorial and it would be an added advantage if you have a basic understanding of XML, HTTP, TCP/IP concepts.